5 'Sell My Harley Fast' Tips! Have you listed it on Craigslist or tried a cheap motorcycle classified site and didn't get any bites? Just dreamers? I know it can be frustrating. Here are some motorcycle selling tips that will give you a better chance of selling your motorcycle fast. So whether you are saying to yourself, 'Sell my Harley Davidson motorcycle', or you want to sell your custom chopper, cruiser, or import, here are a few tips that will show you some of the best ways to sell your motorcycle. Tip #1: First, take excellent pictures of it. Take close-ups of the engine, wheels, and any notable parts that are selling points. For example, if you have custom foot pegs, handle bars, or wheels...whatever, take close ups with a good digital camera. Tip #2: Take a video of it as well. Start it. Put your video recorder on a stand to keep it still. If you don't have HD, use or barrow a high quality hand held recorder and put it on a tripod. In the video, talk about the features of the bike, and why you think it's a prize. Also, when you take the video, don't start the bike and then talk. Talk about the bike and point things out, then start the bike. If you want to point something else out, turn the bike off. Your video doesn't have to be a Spielberg production. Just do an OK job, and look your best. Video Tip: If you don't want to actually video tape your bike or you don't want to talk on camera, or the whole video thing is a little intimidating, not to worry. You can use simple software that loads your digital pictures automatically, and then you can create a slide show video using the pictures instead. In many cases they turn out better than live videos because you can focus on taking good pictures instead of a good video. 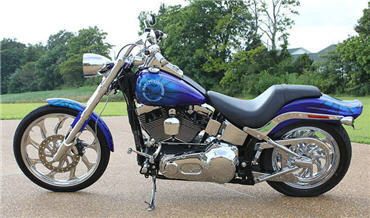 Here is an example of one we did on bobber choppers. If you are going to be in the video, dress nicely and be professional. People who are going to be giving up their hard earned money don't want to see a dirty, mouthy guy or gal and they definitely don't want to buy from one. Tip #3: Write down all the features of your bike. Tip#4: Write a short paragraph about your bike. Write like you were talking to a friend about the bike. Don't be hyped up and sound like you are full of it. This is called you 'sales copy'. You are going to use these as your sales tools on your listings on the sites recommended below. •	Do not use all caps. •	Bold the most important features of your listing. •	Do not bold often. Just enough to move the reader through your page. •	Do not use more than two colors in your text. •	Do not use huge pictures that take forever to load and requires buyers to scroll in order to figure out what you are selling. In addition to listing your video on the above motorcycle classified sites, place your video on Youtube.com. Use the tools on Youtube.com to put captions in your video (it's really easy) which state that your bike is for sale. Put the make and model of your bike in the headline and text portion of your video so that when people type it in on Youtube.com your bike comes up. On ChopperExchange.com you can put up a video clip on any package you choose. Their packages range from Basic for $24.95 (two months) to Ultimate which is $79.95 (until sold). CycleTrader.com ranges from $19 (two weeks) to $69 (12 months). Not as good as ChopperExchange.com but if you sell it on CycleTrader it's worth it, right. I would choose Ebay over CycleTrader.com first. And if it doesn't sell on Ebay then try CycleTrader.com. ChopperExchange.com's Ultimate packages is worthwhile, especially now because the sales cycle (how long it takes to sell) is longer right now. Ebay is for a set period of time that you decide upon. You can read their tips on listing a bike for sale here. Your first four listings are free until you successful sell your motorcycle. If you do sell it within the first 4 listings you pay Ebay $100 plus a reserve price of $7 if you use a reserve price. Here is a little test we did. To find out what the most popular motorcycle classified sites were we typed in common phrases that people use to find bikes for sale (this may have changed so do it yourself. Ebay is probably the #1 site for selling your bike aside from Craigslist. These are general phrases, and Google changes things around very often (so do your own test). But it's a good test because they are commonly typed into the search engines, and if a site pops up often then you know that it's getting good traffic. I listed on eBay. eBay is one of the main places people go these days to buy anything under the sun. They get almost the same number of searches as Google, but the majority of searches on Ebay are people looking to buy something. So list on Ebay no matter what. Tip #5: Now that you know where to list your bike for sale, it's time to create a your sales page. All of the sites that you will list on have different features. Remember your features, sales copy, and video you created in the first part of this article? Put them all up on each motorcycle listing on each site. I hope this article helps you out. Please leave your comments below about this sell my harley article....if you have any tips or success stories on selling a motorcycle. New! 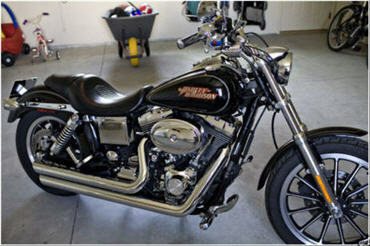 Motorcycle and Chopper Classifieds Site Reviews and Recommendations.